´South Korean LPGA star Park In-bee will reclaim the No. 1 ranking in women's golf following a runner-up finish at her latest event, the LPGA Tour said. 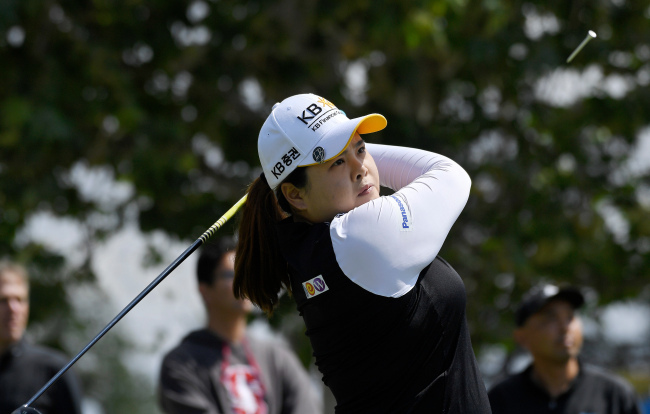 Park finished tied for second at the Hugel-JTBC LA Open at Wilshire Country Club in Los Angeles on Sunday (local time), but it will be good enough to lift the world No. 3 past current Nos. 1 and 2, Feng Shanshan and Lexi Thompson, to the top of the new rankings when they're announced Monday. Park spent 92 weeks as world No. 1 during three different stretches between 2013 and 2015, and last held that spot Oct. 19, 2015. She was No. 13 on Jan. 1 this year. In LA, Park and fellow South Korean Ko Jin-young both finished at 10-under 274, two strokes behind the winner, Moriya Jutanugarn. Park was sitting alone in third place after three rounds and needed to finish sixth or higher to dethrone Feng, who has been No. 1 since last November. Prior to this tournament, Feng was in the top spot with 7.05 points, followed by Thompson with 6.75 and Park with 6.67. In LA, Feng and Thompson tied for 12th place. The world rankings evaluate a player's performance over a rolling two-year period weighted in favor of the current year, and an extra emphasis is placed on the most recent 13 weeks. As she has done so all year, Park didn't put much stock in her ranking position. "It's good to be back, obviously, in the No. 1 spot, but that really wasn't my goal playing this year," she said. "All the rankings are so close together. It can change every week. It's just hard to keep track. I'm just trying to play golf, and (it) doesn't matter where I am at." Though she came up shy of her 20th career LPGA win, Park is enjoying a nice bounce-back season in 2018 after missing the late part of the last season with a back issue. The LPGA Hall of Famer now has one win and three other top-three finishes over her previous five tournaments, dating back to mid-March. "Pretty good play throughout the couple of months of golf for me," she said. "Everything has been pretty consistent. On the greens, some days, I was really good and some days, I was really bad. Just got to work a little on putting. That's it." Park has also extended her lead on the money list and in the points race for the Player of the Year honors. She entered the LA tournament with $586,984 in earnings for the season and added $120,105 to reach $707,089. Moriya Jutanugarn is in second place now with $533,701, after picking up $225,000 with her win in LA. In the Player of the Year points, Park now has 75 points, 14 ahead of Pernilla Lindberg. Players receive points based on top-10 finishes: 30 for wins, 12 for finishing second, and nine points for ending in third, and so forth. Points are doubled at five major championships.